According to Apple's latest iOS App Store checks, published to the company's developer webpage, 75 percent of compatible devices are running some ilk of iOS 9. 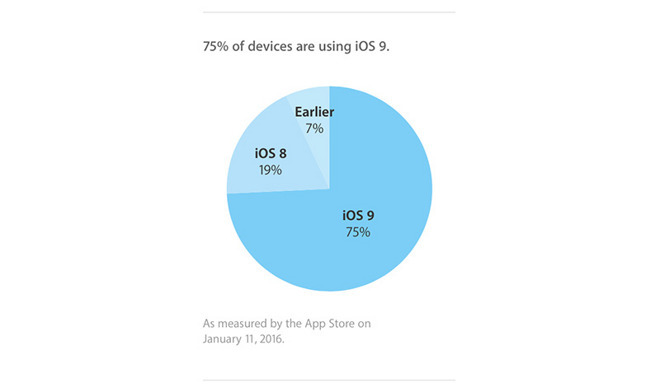 As iOS 9 distribution increases, older operating system share decreases, with 19 percent of users on iOS 8 and another 7 percent running older OS versions. In November, iOS 9 share was pegged at 70 percent, growing at a rate of about 1 percent per week, roughly in line with current projections. Adoption of Apple's current iOS is far outpacing that of its iOS 8 predecessor, which only managed to eke out a 68 percent distribution rate at the same time last year due to a botched point update that brought adoption to a standstill. It took iOS 8 some six months to make it onto 77 percent of compatible devices. Looking forward, Apple on Monday released a feature-packed iOS 9.3 beta that should drive adoption even higher. The test build is one of the more substantial point updates in recent memory and includes a new nighttime viewing mode called Night Shift, secure Notes and various educational tweaks for iPad like user profiles.